A computerised repeat prescription system is operated to provide a quick and efficient service to those authorised by the Doctors to have repeat prescriptions. Patients on repeats will need to see the practice Pharamcist at intervals in order for their medication to be reviewed. Please only use these methods if you have no internet access, otherwise we would prefer you to use the online method above. You can post your repeat order form to the practice. Place your repeat reorder form into the grey box at the front of the waiting room. Requests by telephone will be accepted on the 01609 772105 Option 2, between 12:30pm – 3:00pm (Mon – Friday). Telephone requests are for exceptional circumstances - only if you are unable to use any other method. We dispense medicines to our patients, should they wish, if they live in any of the villages more than 1mile from the Northallerton chemists. Repeat prescriptions can be ordered as mentioned above, but please allow 2 full working days before collecting your dispensed medication from the Surgery, as this will allow for accurate prescribing. The dispensary is open for collection of medication and prescriptions from 8:30 to 18:30, Monday to Friday. The surgery now provides a medicines delivery service to the surrounding Northallerton area, for a complete list of villages we deliver to please click here. If you are not in when the delivery driver attempts to deliver your medication, they will be returned to the surgery and you will need to come and collect them at your earliest convenience. If you wish to partake in this service please either print off and complete an 'Application for Home Delivery of Dispensed Items Form' or ask one of the dispensary staff who will provide you with one. The service WILL NOT include the collection of your repeat prescription slips. Prescriptions will be ready for collection in two full working days (longer by post) if you will be picking the prescription up from the surgery. Patients can either collect their prescription document from the surgery, or directly from a chemist of their choice. In order for prescriptions to be collected from a chemist, patients need to nominate a chemist to receive prescriptions electronically (preferred option). Our Dispensary: Eligible patients can collect their prescription medication from the Mayford House Surgery Dispensary - see above. The Electronic Prescription Service (EPS) is an NHS service. EPS enables repeat prescriptions to be sent to pharmacies via a secure internet link, this allows you to request your repeat prescriptions to be sent to a pharmacy of your choice, regardless of where you are in England, to be collected by you or a relative at a more convenient location rather than having to travel to the surgery. Find out how this could save you time by downloading our leaflet. Patients on repeat medication will be asked to see a pharmacist once a year to review these regular medications and notification should appear on your repeat slip. Please ensure that you book an appropriate appointment to avoid unnecessary delays to further prescriptions, and ensure any necessary blood tests are done at least 2 days before the review appointment. If you are given 28 days of tablets and you have 7 days left, order your new prescription. It is good practice that repeat medication is regularly reviewed so that you get optimum care. Please make note of the review date and make an appointment to see the pharmacist, ensuring all relevant blood tests done before this. If you are going on holiday you should take a list of your medication with you. In case you have a problem ensure you have enough medication to cover your holiday. Some countries also need a doctor's letter to explain the medication. Check with your travel agent. There maybe a charge for such letters. If you have elderly relatives ensure that they have an adequate supply of their medication. Please do not order a repeat prescription more than 7 days before it is due as the prescription cannot be processed. Please book your medications review appointment in advance, to take place at least 10 days before your medication runs out. 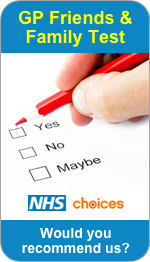 Further information about prescription charges and Prescription Prepayment Certificates (PPC) can be found on the NHS Choices website. Information on Prescription charges and who is entitled to free prescriptions can be found here. When private prescriptions are brought in with a request for them to be changed to an NHS prescription, the normal 48-hour rule will apply. Prescriptions are unable to be changed immediately. If a prescription is deemed by the prescribing consultant to be urgent, please could you redeem the prescription at the appropriate hospital pharmacy. If new medication is being issued we will not issue more than one month at a time until you have been established on this medication in order to prevent expensive drug wastage in the event that the medicine does not suit you.